Perhaps it’s the onset of premature senility, (or the insignificance of the ages between 21 and 25), but when this year’s birthday came around, I genuinely had to take a moment to recall whether I was turning 22 or 23. After consulting multiple calculators and various mathematic professors, (all of whom confirmed that it was indeed my 23rd birthday), I have to say that my confusion only grew. Am I old? Am I young? Am I something in between? What kind of a pointless age is 23? Such questions plagued my mind, and as I struggled to grasp the basic concepts of numbers and ageing, Steak decided to shut me up with a meal at HS&Co. 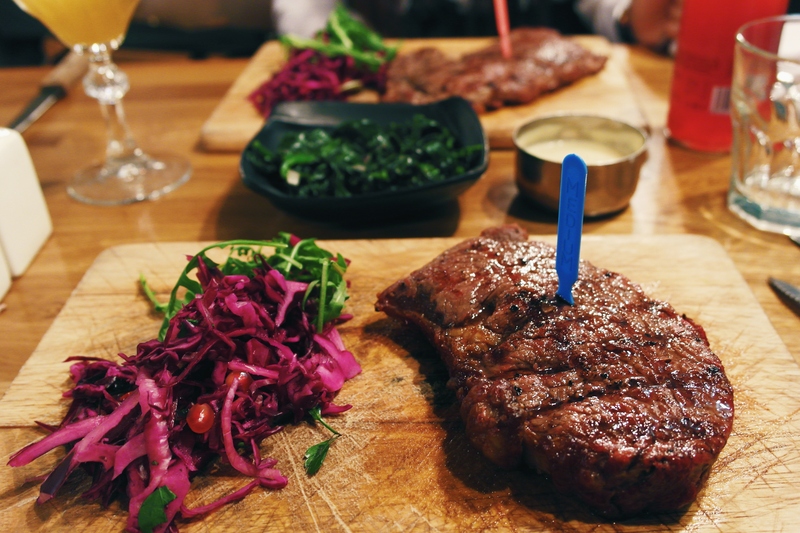 After springing into existence in April of 2016, there’s no denying that East London’s latest steakhouse has received something of a mixed reception. 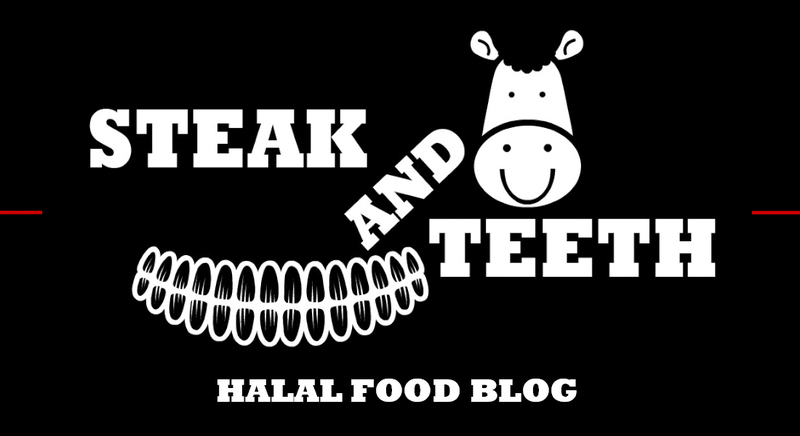 Opinions have been divided amongst fellow bloggers and casual food enthusiasts alike, and it has been difficult to tell if such variation was simply due to teething issues that would be expected of any new establishment. Having delayed our visit for about six months, Steak and I decided that they had had ample time to settle in, and headed over to cast our vote. 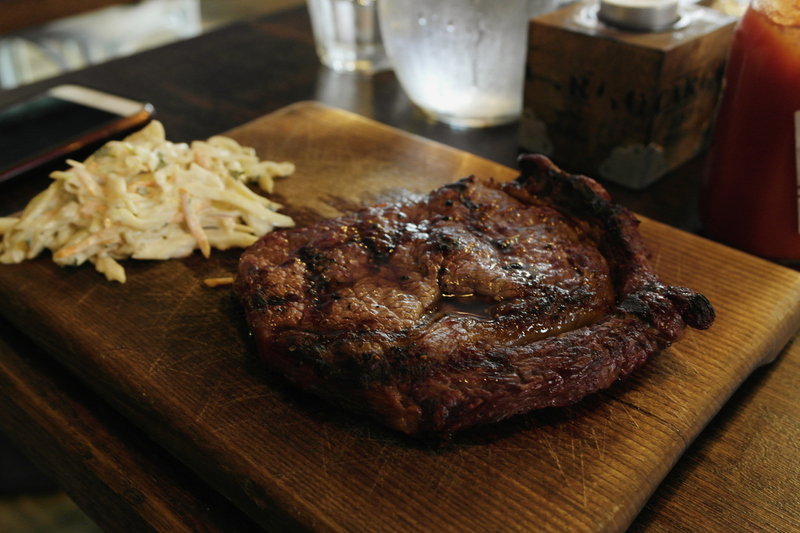 A quick glance through HS&Co’s clear-cut menu instantly reveals the blend of European and North American influence. 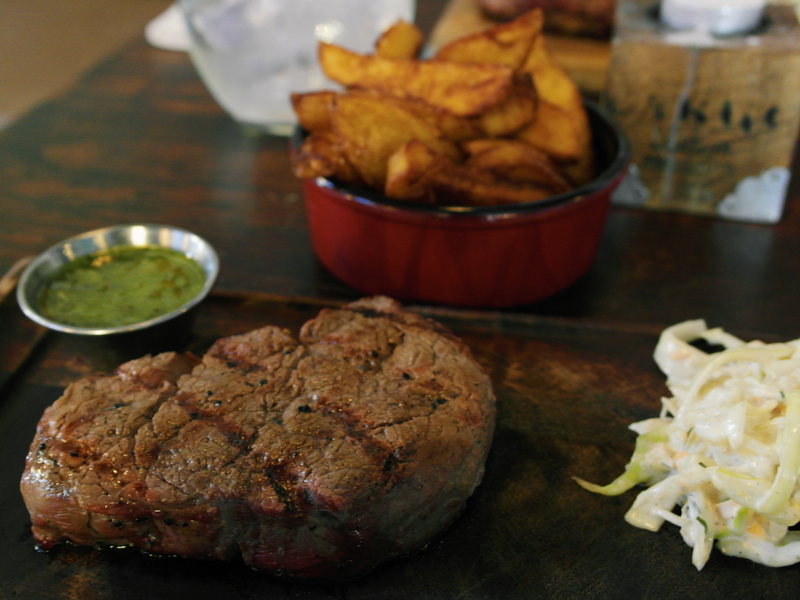 “Silly marinades” are promptly denounced, Irish steaks take centre stage amongst a variety of alternative dishes, and it’s clear that simplicity and purity is the primary focus. 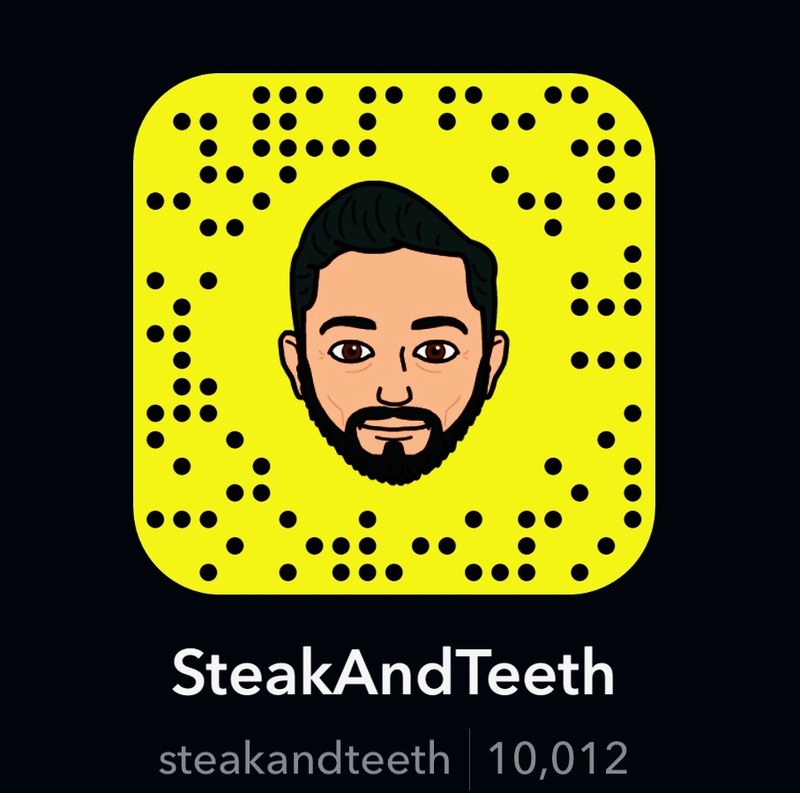 Whether that focus had actually been achieved remained to be seen, and so, Steak and I plunged straight in and ordered a 300g (10oz) ribeye and a 200g (7oz) fillet respectively, with a portion of “triple-cooked chips” and béarnaise butter on the side. As per my order, the fillet steak arrived medium-rare, and thereby retained its inherent juices, and remained remarkably tender and succulent throughout. The generous helping of salt and pepper also did well to enhance and elevate the inherent flavours of the steak – though these flavours weren’t quite as rich nor as deep as I was expecting. Despite the higher fat content, Steak’s ribeye was equally reserved and one dimensional in its inherent flavour, and one can only wonder whether a subtle basting in butter and herbs would have enriched both steaks, and added the greater depth of flavour that I was looking for. 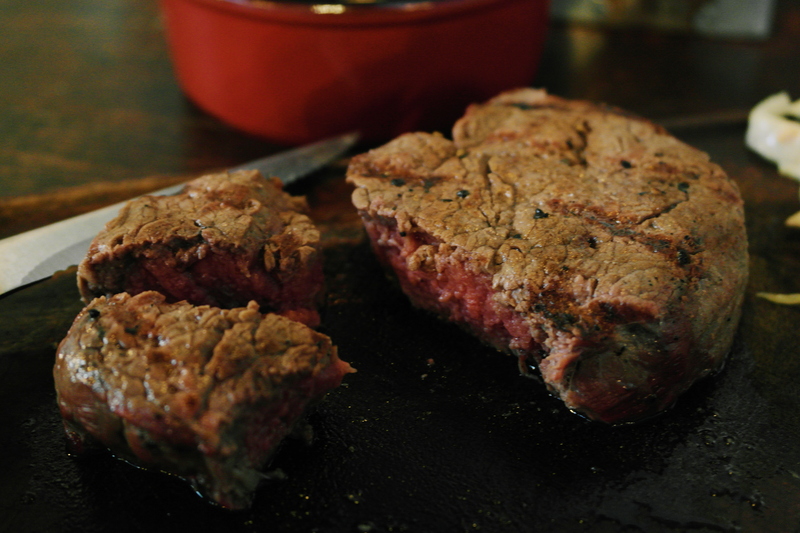 The ribeye did however, possess a slightly more balanced level of seasoning than the fillet. Credit is also due for the fairly tender texture that was achieved with the ribeye, despite Steak’s insistence that it be slightly ruined (cooked to medium). The triple-cooked chips meanwhile, proved to be utterly fantastic. Consisting of soft, thick potato in a crispy, rustic coat, they quickly became addictive, and I gladly polished them off when Steak could handle no more. 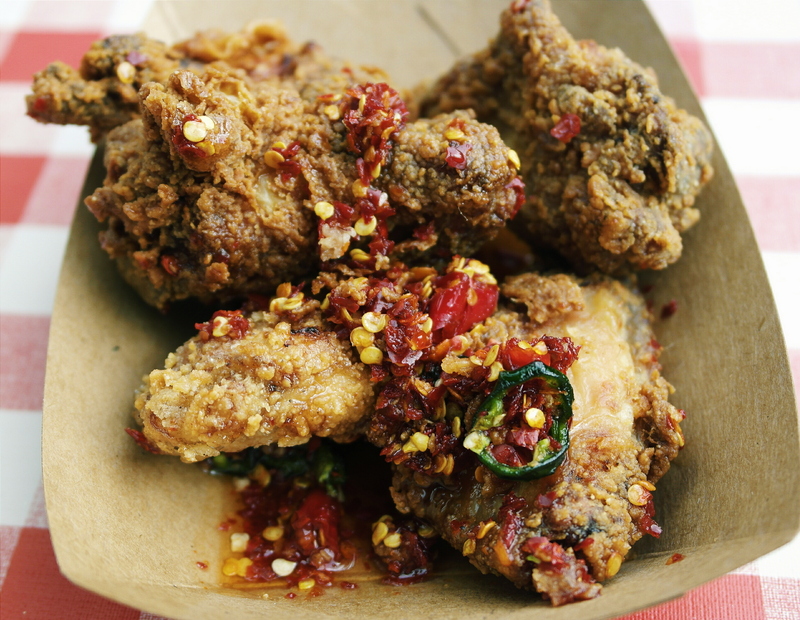 On a side note, it’s also worth mentioning HS&Co’s honey and chilli chicken wings. We tried them at The London Halal Food Festival, and found them to be pleasantly crispy and sticky in texture, with a subtle, sweet flavour. As we began negotiations to decide upon a dessert, Steak revealed that she had never before eaten a key lime pie. Flabbergasted as to how she had lived with this void in her life for so long, I promptly ordered HS&Co’s deconstructed version of this iconic dessert. 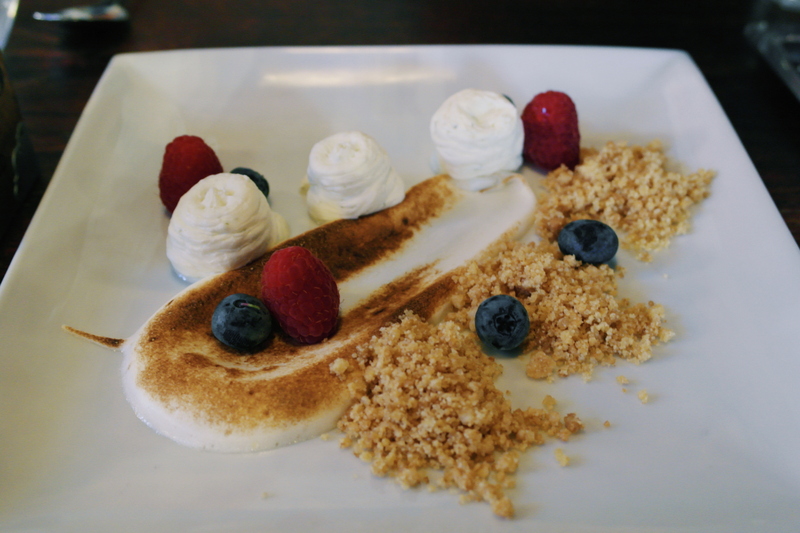 A plate of ingredients arrived soon afterwards, consisting of thick, piped cream with a rich lime flavour, soft and gooey meringue, a rubble of biscuit crumbs, and an assortment of refreshing blueberries and raspberries. It was certainly an interesting incarnation, but as a traditional man, I really would have preferred a heavier, constructed version. After all, a truly successful dessert is one that leaves you needing an airlift back home. A couple of weeks ago, we accepted an invitation to return to HS&Co, and Steak insisted that we start things off with a bowl of nachos. Much to my surprise, the combination of crispy, crunchy nachos, smooth sour cream, and earthy guacamole was exceedingly moreish, and the sharp kick offered by the freshly cut jalapenos melted my otherwise frosty attitude towards “snacky” food. Opting for a non-alcoholic “Disney Martini” to go alongside them, (a natural pairing of course), I was greeted by a rich and sharp sweetness of passionfruit, and a light and fruity “champagne” side. Whilst I’m certainly no expert on either martinis or champagne, both were certainly refreshing. Nachos and (non-alcoholic) Martini / Champagne. The Bridget Jones diet. However, the steaks on this occasion, were a total disappointment. Despite being cooked to our specifications, both my medium-rare ribeye and Steak’s medium-cooked sirloin were tough and near-inedible, and both steaks possessed an incredibly dull, flat flavour that lacked sufficient depth. We discovered soon afterwards, that HS&Co had taken on a new steak supplier, and the quality of the beef was not of the standard that they were expecting. Whilst this is a temporary issue that has hopefully since been resolved, we felt that it was only right to inform our readers of this occasion. Of the items we ordered on our first visit, my 200g (7oz) fillet cost £25, whilst Steak’s 300g (10z) ribeye cost £20. Together with the chips (£3.25), bernaise butter (£1.25), and key lime pie (£6.25), this amounted to a total bill of £55.70. Generally, starters range from £6-£10, mains range from £10-£25, sides range from £3-£8, and desserts and drinks cost around £5-£7. Whilst the steaks themselves are reasonably priced, the other items on the menu seem to be a little costly for what they are. Granted, HS&Co aims to be a fairly high-end establishment, but given that the food doesn’t quite reach that standard yet, the financial demands do seem to be a bit of a stretch. There are many things about HS&Co however, that simply can’t be faulted, and service is certainly one of them. Staff members are attentive and welcoming, and the team manage to work with a reasonable amount of efficiency. 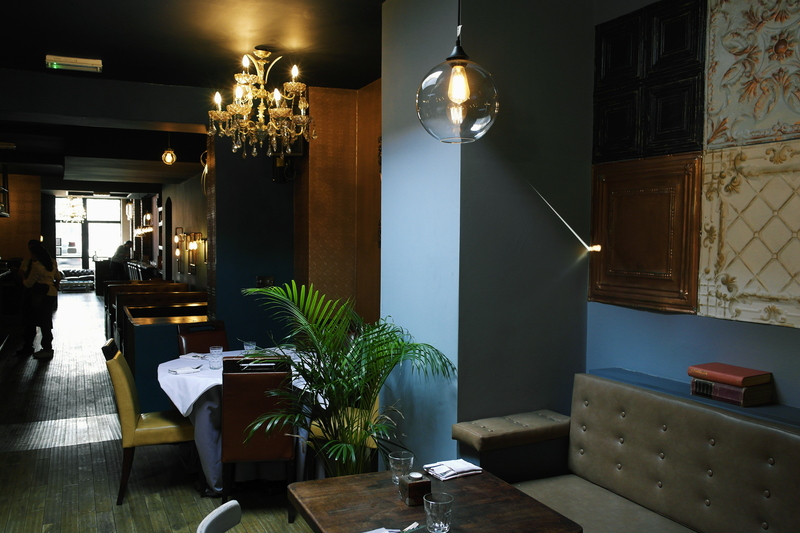 This hospitality extends into HS&Co’s decor, which, funnily enough, is as graceful and elegant as any neighbourhood in London besides Stratford. As soon as you walk in, you’ll be transported through time into a dining room from the 1940’s, complete with glitzy chandeliers, dark wood, and an assortment of aged furniture. This period setting certainly exudes a certain sense of refinement, and as an 80-year-old-man in a 23-year-old’s body, I can’t help but feel right at home. In a part of London where “well-done” is synonymous with “medium-rare”, and swimming pools of marinade are considered to be the bare minimum, it seemed refreshing to finally have a steakhouse that would take a purist’s approach to everyone’s favourite slab of meat. Sadly however, as much as we appreciated the ambition and finesse conceptualised by HS & Co, we have to say that our experiences fell woefully short of our expectations. It’s clear to see the standards to which HS & Co are aspiring towards, and although the decor attains that level of grandeur, it is sad to say that the food, at present does not. Disclaimer: Our second visit to HS&Co was a complimentary invitation.